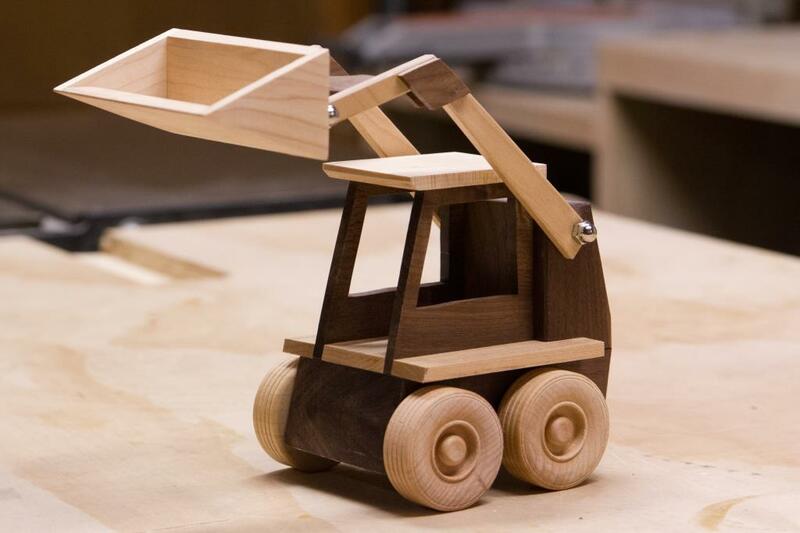 I’ve made a project in the woodshop every year of Elijah’s life. That’s kind of a hard trend to break. The first year was a table and chairs and ever since then, I’ve made something from the Wood Magazine construction sets (end loader, dump truck, semi lowboy and dump trailer). I stuck with that theme this year and made the skid steer. I was crunched for time and it was a small project so it seemed like a good fit. Thanks to Tim for giving me some scrap maple so I didn’t have to make a run to the lumber store. Follow him on Instagram under the @woodscreekwoodworks account. The project went pretty smoothly, but, again, I felt like the instructions could have been better. There was too much precise cutting and hoping that stuff lined up later. Why not just leave it all a little long and then flush it up later? I need to get better at building stuff in my head to recognize these opportunities. I bought the kit that provided all the hardware and wheels and it came together pretty quickly. 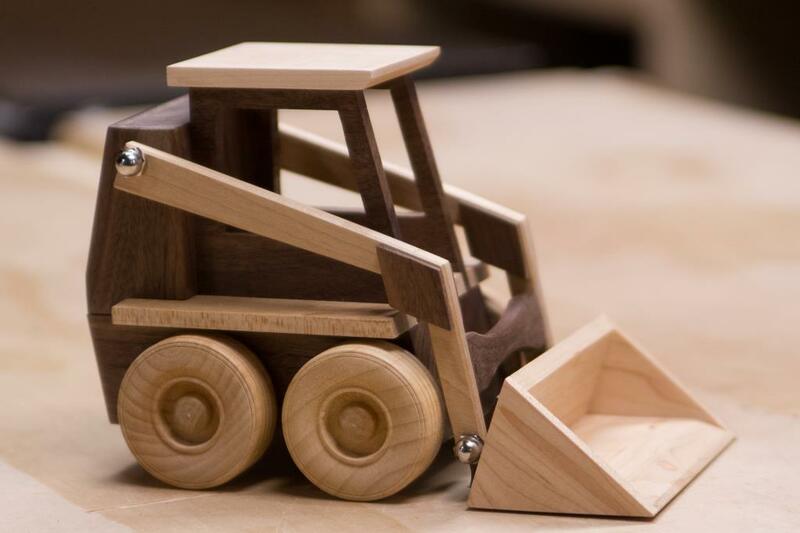 With these toys, I’ve learned to mill up lots of extra wood so that I can have another crack at it when things go wrong and that skill proved useful here. Some day I won’t be able to post this stuff early, but for now, Elijah doesn’t read my blog so I can show you a picture early. Merry Christmas! Years ago, I didn’t understand how wood got milled to the right dimensions. When I planned out Tyla’s jewelry box,I spent an unreasonable number of hours trying to figure out how to get wood that was the right thickness. Fast forward a few years and I’m now much more comfortable with buying any sized chunk of wood and getting it to the right thickness, width and length. First I use the jointer to get two flat and 90 degree faces on the board. These give me good (and safe) reference points to use other tools. If the wood is much thicker than I need, I’ll use the bandsaw next. This lets me slice down the length of the board to make two thinner boards.It’s less wasteful than turning all the extra thickness into sawdust. The bandsaw isn’t incredibly precise and it leaves some saw marks, so the next step is the planer. I use the jointed face on the bottom as a reference and then make the top face parallel and get the board to exactly the right thickness. The final step is the last edge and that can be easily trimmed up on the table saw. When I started building Elijah’s Christmas present, I took a video of that process of milling one board. It was only about 1″ thick and I need a 1 1/2″ thick board so I milled it down to 3/4″, cut it in half and glued the two halves together. 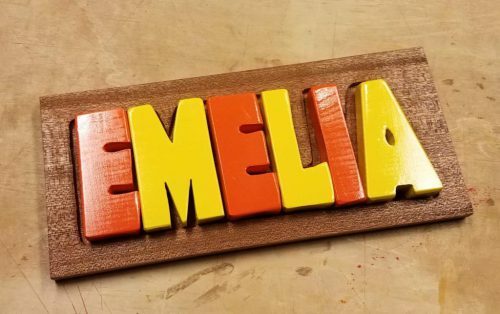 Tim and Chelsea’s daughter had her first birthday and Tyla had the idea of a wooden name puzzle. I decided to give it a shot. I found a font that I liked, printed out her name and then used spray glue to stick it to a piece of pine. That was cut out on the bandsaw and sanded. For the paint, I went with a spray enamel which I hadn’t used before. It worked well but the weather was cool and rainy so it was hard to get the coats to pile up. In the end I left it with the top looking great and the other sides looking passable. For the bottom, I grabbed a scrap of sapele and routered out space around the letters. It might be a bit too challenging of a gift for her to do at this point but it was fun to make and she seemed to enjoy moving the pieces around. When we visited Grandma Martens this summer, she showed us a photo album of a bunch of Grandpa’s woodworking projects. I thought that was a pretty neat idea, and while I’ve blogged about most of them, I thought I’d walk around the house and make a video of my projects. I realize it’s dorky, but what did you expect from me? I chose maple, walnut and paduk for the white, brown and red pieces. The key to this project is getting all ~150 squares to be totally identical in size so that when you build them into Mario, the lines stay straight. The next trick was getting a chamfer cut on all four sides of the squares. 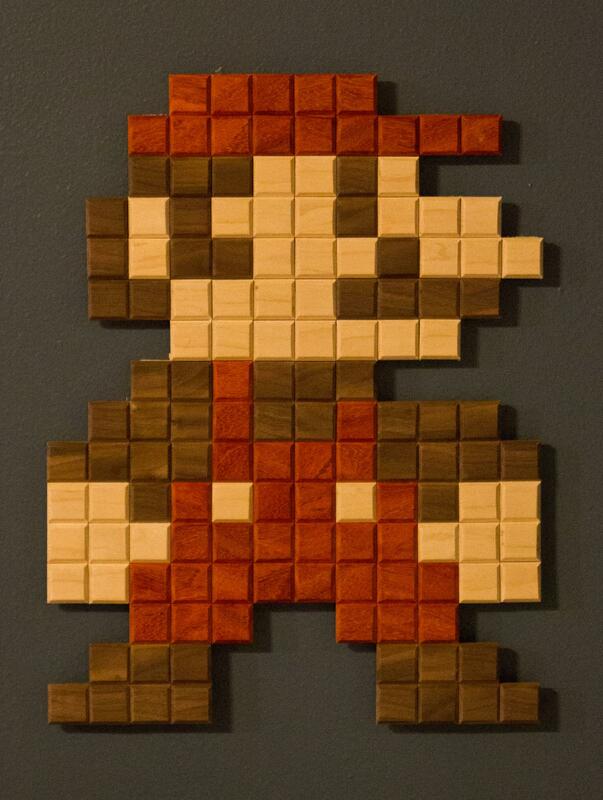 This helps to define the edges and made each square look more like a pixel. I cut two of the sides with a router when the wood was still in 1″ strips. After cross cutting those strips into squares, I set the table on my small disc sander to a 45 degree angle and sanded the rest. Then I had to hand sand each square to clean them up. David put his on to a square piece of plywood and made a frame for it, but I wanted to make mine frameless. I cut out a piece of plywood on the bandsaw that would be just smaller than the assembled Mario. I picked a row near the center and carefully glued it as straight as I could. From there I glued two or three rows at a time working out toward the top and bottom. I took my time and let the various rows dry before getting too far so that I could make sure I was staying straight. I love this project! Thank you David for the inspiration!